32 years ago, WWE debuted a new concept that would pit teams of 5 against each other in an elimination tag match. Originally planned as a way to continue and create feuds rather than end them. 1991 saw the first WWF title defence while 1998 was the first time a traditional survivor series match didn’t occur, instead, a tournament was held to determine the new WWF champion. In recent years the Survivor Series has lost its original touch, with traditional matches being an after-thought. Throughout the years Survivor Series has provided a countless number of memorable moment. It is the second oldest PPV in WWE history. It has seen a fair share of great shows but at the same time, some awful ones as well. Since the traditional Survivor Series matches are 5-on-5, here are my top five Survivor Series shows. Undertaker punching the lights out of Dusty Rhodes. This edition of Survivor Series was the debut of the storied WWE career of the Undertaker. 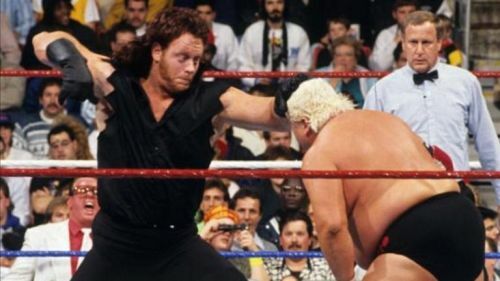 Survivor Series 1990 marked the one-time appearance of the “Grand Finale Match of Survival” with the sole survivors competing against each other, which was an interesting concept at the time. The two biggest stars coming out of the event were clearly Warrior and Hogan, those two received the most build-up as we were heading close to WrestleMania season. The debut of the Undertaker was memorable and is something every wrestling fan should go back and watch because of how historically important it was. He was protected by not getting pinned or being forced to submit and it made him look like a major star right away. In my opinion, the finest debut of all time, considering what the Undertaker would go on to achieve as he cemented himself as one of wrestling’s greatest ever creations.